Clixsense is the genuine most trusted and one of the top advertising paid to click (PTC) website. By taking advantage of the online advertising program, as a potential online customer, you can actually get paid for your web browsing, up to $0.02 for every website you visit/advertisement you click. There are few other ways to earn through clixsense, you can earn by completing the tasks, participating in surveys, playing online games, completing the offers etc. It is the best PTC website of all as they pay more and pay on time. Clixsense can also be called as GPT site as it provides various ways to earn money. You can earn more than $5 just working for an hour. Useful link : Top 10 genuine PTC sites – Rating. 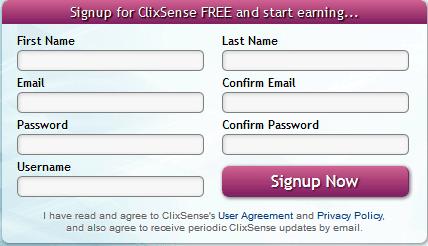 You can start earning immediately after registering your account in clixsense. Enter your first name and last name. Enter your valid e-mail ID. Choose the user name and password of your desire. Make sure you remember your user name and password, because in future you will have to use these information to sign into your account. Agree their terms and conditions and click signup now. Now you are successfully registered to clixsense. Continue to read for more information about clixsense. You might also like this comparison review – Clixsense vs Neobux. As mentioned earlier there are many possible ways to earn with clixsense. In the following session you can see the various jobs/tasks provided by clixsense to their members. To start earning click view ads on the menu bar. Various types of ads with different pay rates will load. There are five types of ads provided to click. There are the micro ads, mini ads, standard ads, extended ads and the sticky ads. Pay rates are as follows: Fixed ads – $0.02, Micro ads – $0.001, Mini ads – $0.001 to $0.002, Standard ads – $0.01 to $0.02, Extended ads – $0.005 to $0.01 and finally the sticky ads $0.001. To start earning click the ad. After you click on the ad you will be taken to the new page with advertisement as shown below. To make your click valid you have to click the cat image as shown below. This cat click verification is made by clixsense in order to prevent the robot’s (auto-clicking program) action. You have to stay in the page for few time depending on the ad type. Standard ads has high stay time of about 30 seconds per ad and micro ads has least stay time of just 3 seconds per ad. A timer runs on the left top corner of the page as shown below. Once the stay time completes you can see a message that your account has been credited. Now you can close the page by clicking ‘close’. If you click the dog picture your click will be considered as invalid and you have to try again. Continue to click more ads to earn more. Follow the same procedure for all the ads. Participate in 5 – 20 surveys ($0.50 – $5) per day to earn $5 – $10 per day. You can earn more by participating in surveys than any other tasks. This is the simplest task, you are paid for just choosing the best answer. You can earn above $3 for participating in surveys. 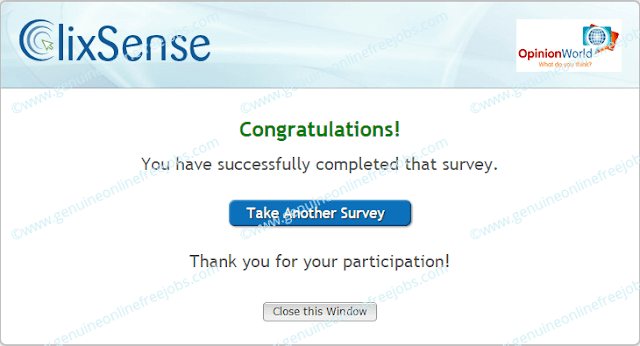 Clixsense makes sure at least one survey is available per day. You may get 5 to 10 chances for participating in surveys. 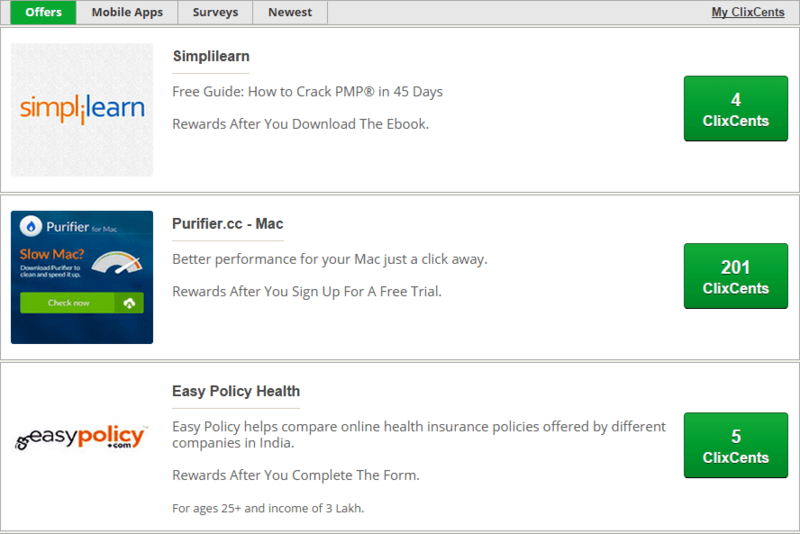 Click surveys tab in the menu bar to check the available surveys as shown above. For each survey their provider, survey length and pay rate will be shown as given in the above picture. Click on the survey to start answering. Pay rate for each survey depends upon the survey length and type. High length quality surveys will pay you more. A sample of survey is shown above. Answer the question and click continue. You will get number of questions similar to this. You gotta answer all the questions to complete the survey. 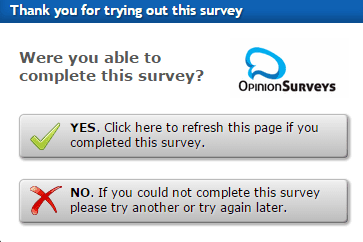 Once you complete the survey successfully you will receive a message as shown below. Click close this window. If you have completed the survey click yes, else click no. You will be paid only after verification. Related link – Online survey jobs. 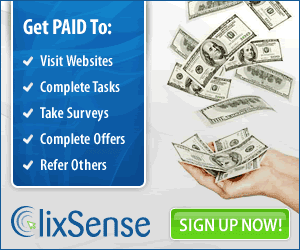 Participate in clixsense research and earn up to $200 by completing a research. Learn more about clixsense research. Another best way to earn more money is by completing the offers recommended by clixsense. Offers will be simple like surveys, watching videos, listening to music online, free trial, form filling, subscribing to free websites etc. Thousands of offers are available from 10 companies. Including a standard clixsense offer of ‘Listening to the radio’. Complete the above offer to earn $0.01. 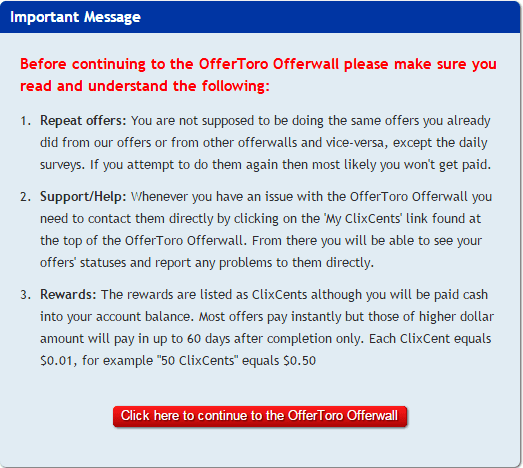 If you want to earn more click the offer wall given above as shown in the picture. More different offers will be available in these sites. After you click, you will get a message. Read and click continue to proceed. This message will be displayed only for first time. From next time you will be redirected directly. A sample of available offers is shown above. Click the offer and complete the task given and get credited. You will be rewarded in form of clixcents. one clixcent is equal to 1 US cent or $0.01. So 100 clixcents is equal to $1. You can earn up to $25 by completing offers. Some offer rewards you more than $25. Earn more than $10 per day by completing simple tasks. Completing tasks takes no more than a minute. For example : There will be a link, you have to click the link and find the author’s name in that article, just copy the author’s name and paste in the given box. For this you will be paid $0.01 – $0.05. So, it will take no more than 30 seconds to check the author’s name. Complete more tasks like this and earn more. 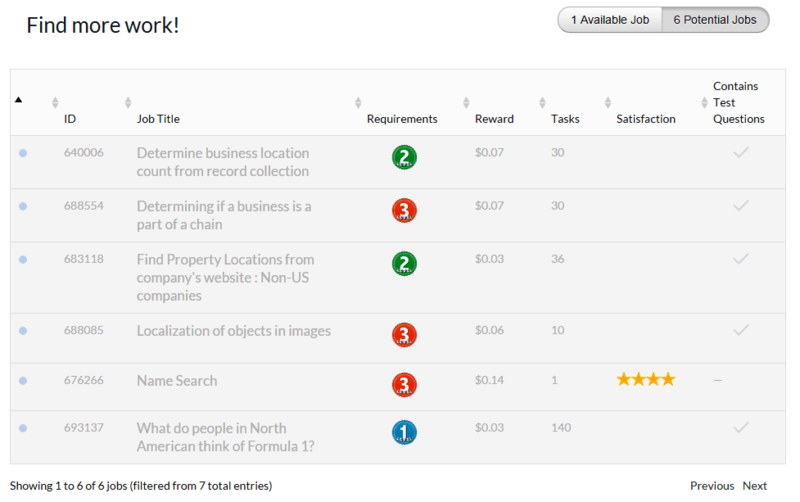 You can earn up to $1 depending on the task and the level. To start click task on the menu bar. Once you click, tasks loads as shown above. 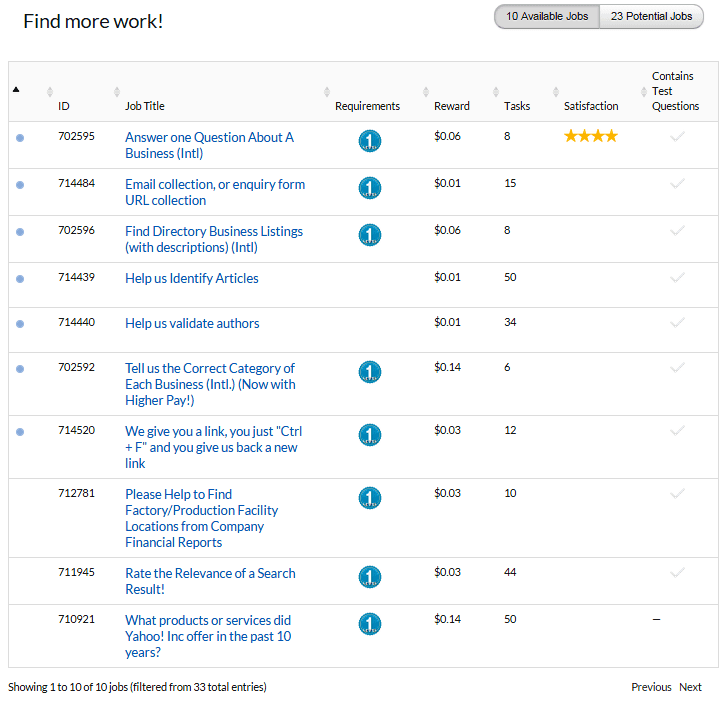 The potential jobs tab shows the list of tasks that you are eligible to participate or complete. In the above image you can see “requirement”. There are three levels. Initially you can only complete 1st level tasks. In future after completing 100 tasks with 75% accuracy you can access 2nd level tasks. Similarly, complete 100 tasks with 80% accuracy to reach 3rd level. The more the level is, the more you can earn and more chances. So, if you reach level 3 you can choose the best among the listed tasks and complete it. If the job is available it will be displayed in the available jobs tab as shown below. Once you click the available jobs tab, the jobs currently available for you will be displayed with the reward information. Click the job title to start your work. Example : How to complete a task? This task is very simple. You have to click the link given there “click here”. A website will open in a new page. The task is you have to answer whether the link is article or not. An article will be in two or three paragraphs. If the link is a Facebook page or forum or online sale or some thing without any information then it is not an article. You can get more information there by clicking “What is an article” and “What is not a article” link shown in the image. Click ‘yes’ if it’s a article, else click ‘no’ and click submit. This is just an example there will be more different tasks like this. By completing such simple task you can earn lots of money. You will be rewarded $5 bonus for each $50 completed tasks. 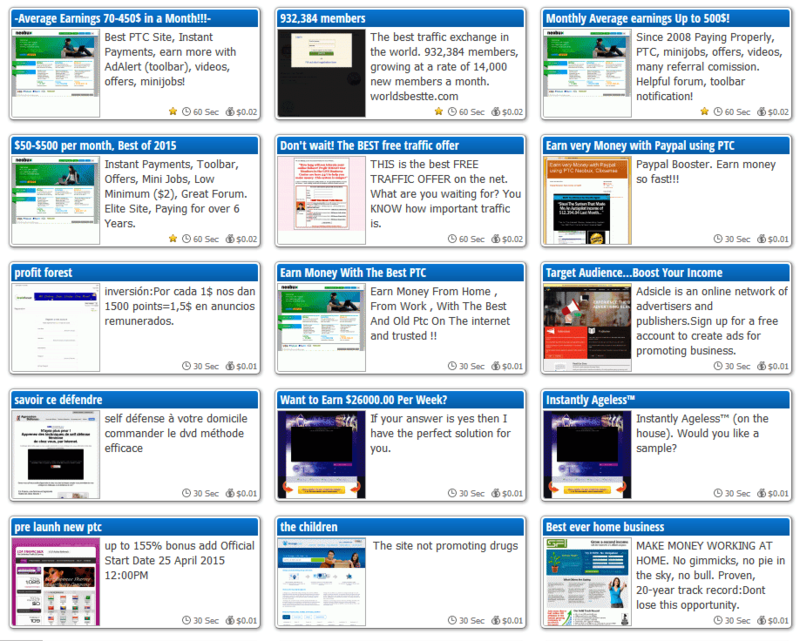 Related link – 10 clixsense tasks explained with screenshots. How many tasks can you complete per day? Look at the task completion statistics shown in the picture above. Top tasks workers complete more than 500 tasks per day. So for example if they are paid $0.05 in average for each tasks, their earnings through task is $25 per day. Weekly contests ($100 reward) are conducted every week and they will pay $50 for top task completer. You can see the referral contest statistics at the right side of the image. You can earn at least $5 per day without any referral if you really work. The above screen shot is one of my daily checklist completed. I’ve earned $4.31 + 16 % daily bonus in a day. The time took for me to earn is just 2 hours. This earning does not include referral commission. Ad clicking – 24 in 3 minutes. Tasks – 49 * $0.07 in 1 hour. Survey – 1 * $0.85 in 10 minutes. 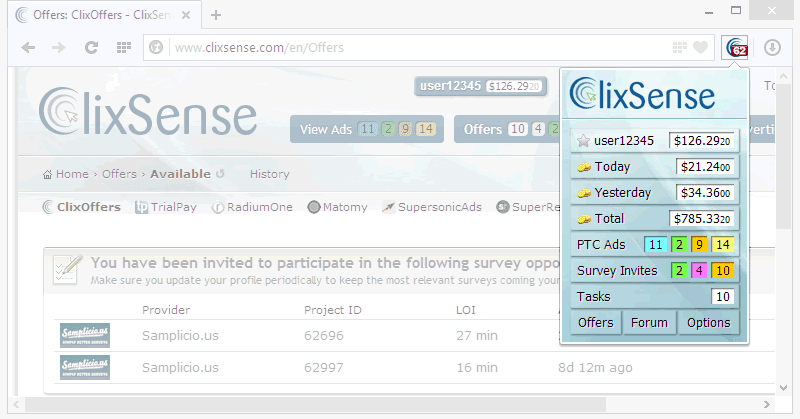 On average, engaged clixsense members used to complete at least 2 * survey + 30 * tasks + 40 ad clicks + few offers per day. Complete check list everyday to get 16% bonus. If you earn $10 you will receive $1.60 as free bonus. 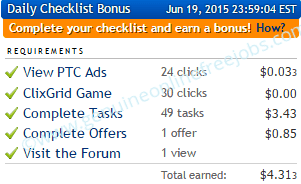 To get bonus you should click at least 6 ads + complete 10 tasks or complete 2 offers or complete 2 surveys + click 20 clix grid. Install clixaddon to remind you. Every time if you get a survey opportunity or if the new ad is available you will get notification immediately. By playing clixgrid you have chance to win up to $10 per day. You will have 30 chances to play clixgrid. 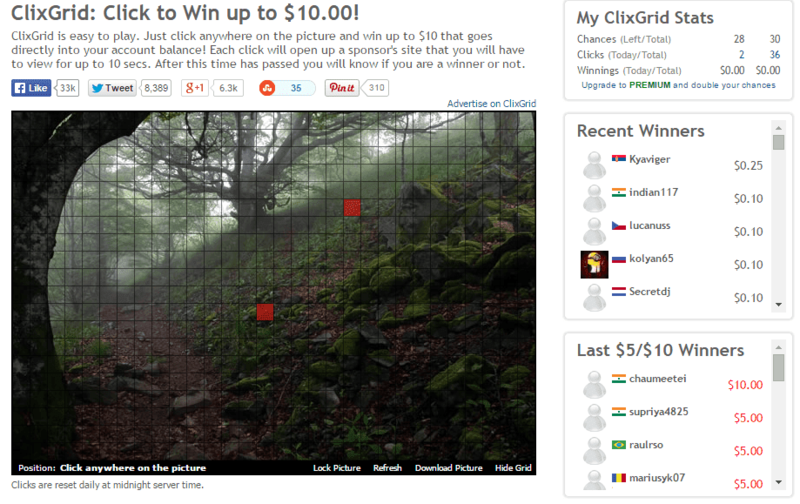 To play click clixgrid > play the game in the menu bar. You will get an image with 600 individual pixels in 20 rows and 30 columns. Just click anywhere on the picture. Once you click an ad page loads as usual. You have to stay on that page for ten seconds. After the stay time the result will be displayed immediately as shown below. As mentioned earlier you will have 30 chances to 60 chances per day and you cannot click on the same pixel more than one time in a day. Remember you will be paid only if you win. You will not be paid for just clicking or if you lose. Play regularly to win more. Initially you might not win, but after 2 to 3 days you will win for sure. You might like this – Clixsense vs Neobux. If you don’t want to waste you browser space by installing the toolbar. You can install the addon which is of course smaller like a favicon as shown below. You can easily track your clixsense account and you can work whenever you want. This is the best way to keep yourself engaged with clixsense daily. Currently only clixsense offers this facility. I personally use clixaddon. Clixaddon is really helpful for me. Particularly it helps me to get survey notification. I never miss any high paying surveys as I use clixaddon. 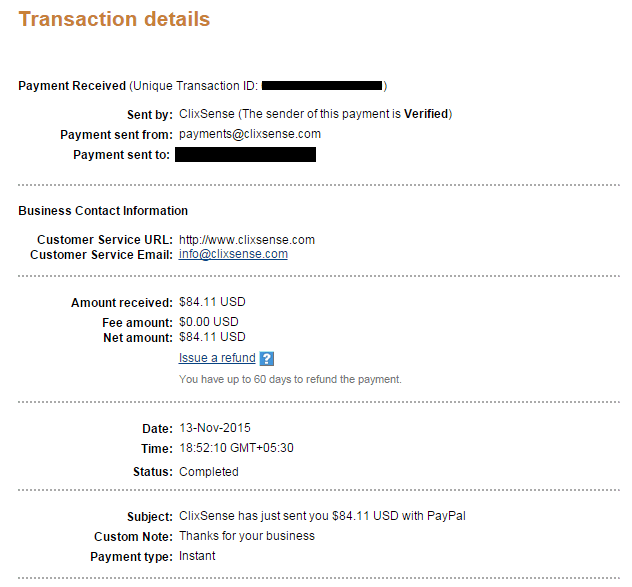 Currently clixsense process your earnings by four methods, which includes Paypal, Paytoo, Payza, Neteller and check. Only people from US and Canada can receive their payments through check. You should update your payment options in your account settings. The minimum cash out for Paypal, Paytoo and Payza is $8. In case if you want to receive your payment through check you account balance should be minimum $10. The Payment email can be different from the email used for account registration. Clixsense is genuine and they pay on time. See the payment proof below. Just click on the image to enlarge. Earn hundreds of dollars by referring your friends or someone. Clixsense pays you up to 10% of which your referral earns. For example, if your friend earns $5 per day clixsense will pay $.50 as referral commission. If you refer 10 people you can earn $5 referral commission per day. 100 refs * $0.50 = $50 referral commission per day and $50 *30 = $1500 per month without working. Make use of easyhits4u to get more referrals for free. IS IT POSSIBLE TO WORK ON CLIXSENSE USING MOBILE PHONE? We can work on clixsense using mobile phone only for participating in surveys and completing offers. Clixsense do not allow us to watch ads using Mobile phone. If you which to work on PTC site using mobile phone – click here. Learn how to work on – Clixsense using mobile phone. Choose your desired user name and password. Make sure you remember your user name and password, because in future you will have to use these information to sign into your account. Now you are successfully registered to clixsense. You should update you profile after log in. Like adding your payment processor ID etc. Also read – Innocurrent review. Tags: Is clixsense a genuine site, clixsense ad clicking PTC job, clixsense tutorial, clixsense working procedure, Clixsense payment proof.